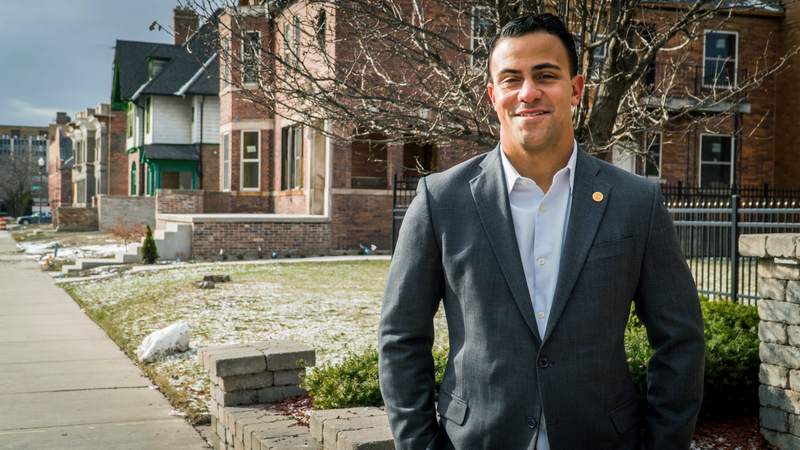 Ian Conyers—the 29-year-old great-nephew of former Rep. John Conyers (D-Mich.)—officially launched his campaign Friday for the U.S. House of Representatives to win his great-uncle’s 13th District seat, after the legendary politician was forced to resign amid sexual harassment allegations. Ian Conyers, a Michigan state senator from the 4th District who announced his run on the west side of Detroit on Friday morning, hopes to continue the elder Conyers’ legacy by ushering in a youthful exuberance to a region that continues to suffer from a dropping population, a 35 percent poverty rate and an ailing economy. During a recent visit to New York City, Conyers specifically mentioned the economic renaissance that Detroit is undergoing and how not enough black people are benefiting from it. “My plan would be to get as many Detroiters and Southeast Michiganders employed so that they can participate in that American dream and that renaissance that you’re hearing about in Detroit,” he told The Root. As a U.S. representative, Conyer says that he would tap into the federal government’s budget for earmarked dollars to secure contracts for minority-owned businesses and provide job training for residents to be competitive for skilled jobs. Born and raised in Detroit, Conyers has a bachelor’s degree in government and a master’s degree in urban and regional planning from Georgetown University. After he graduated, former D.C. Mayor Adrian M. Fenty appointed Conyers as the Ward 6 constituent-services deputy. Conyers worked as a director at the Anacostia Waterfront Initiative, where he helped lead redevelopment projects aimed at empowering small businesses in the region. In 2012 he served as field director for Barack Obama’s 2012 presidential re-election campaign. Conyers returned to Michigan soon afterward to work for the Democratic Party treasurer for Michigan’s 13th Congressional District. An opening for state senator became available in Michigan’s 4th Senate District in 2016 after ex-state Sen. Virgil Smith was forced to resign after a domestic abuse scandal. Conyers won the race with more than 76 percent of the vote against his Republican challenger. The 4th District is a Democratic and largely African-American stronghold, so his margin of victory isn’t surprising. While Conyers has served for just over a year in his state Senate seat, Michigan political consultant T.J. Bucholz said that the word in Lansing, Mich., is that Conyers can be a thoughtful legislator and brings a high level of intelligence to the table. Conyers certainly has competition. Fellow Democrat and Detroit state Sen. Coleman Young II has thrown his hat into the race. So has Detroit attorney and activist Michael Gilmore. The famous Detroit TV Judge Greg Mathis was considered a candidate for the seat but said in a statement that he is taking his name out of consideration. The elder Conyers endorsed his son John Conyers III to run for the seat, despite criticisms about his lack of political experience. When asked for comment, Conyers III told The Root that he hasn’t decided whether he’ll run and declined to comment further. Calvin Harris, Ian Conyer’s campaign manager, said that his candidate has secured the fundraising services of Angerholzer Broz Consulting, a firm that has raised money for House Assistant Democratic Leader Jim Clyburn (D-S.C.) and Congressional Black Caucus Chair Rep. Cedric Richmond (D-La.) and other House Democrats. If Ian Conyers wins, at 30—the age he’d be by the time he is sworn in—he would be one of the youngest members of Congress. Until then, Conyers will be hitting the pavement, going door-to-door, trying to convince voters that he is the best candidate to help lead his district to a more economically prosperous future. One of the first tasks he wants to take on, if elected, would be rebuilding Michigan’s crumbling transportation infrastructure, with Detroiters filling those jobs with federal financial support.